The DG-16-2 & DG-16-G walk behind diamond grinders are unlike any other diamond grinder on the market today. 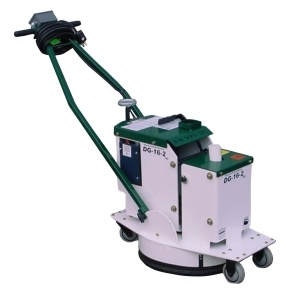 What sets this floor grinder apart from all the others is the floating grinding head and the specially designed shroud that keeps the machine virtually dust free when connected to the B-101 Pulse Vac along with removing all material off the floor reducing clean up cost. We started with a diamond and worked our way up. After several scraped designs and years of research and development, we are extremely happy with the end product. 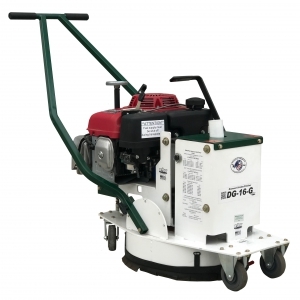 This is not a converted terrazzo grinder or wood sander, this machine was designed for coating removal to high gloss polishing on totally dry concrete. With the one piece 16” rubber mounted grinding head (no planetary gears) that is adjusted up and down by spring pressure, you have infinite adjustability. The diamond segments can easily be changed from course diamonds for coating removal to fine resin pads for polishing. The response we have been receiving from our customers with the DG-16 is “Total amazement”. The production is two to three times faster and has a more consistent profile than any other diamond grinder they have used.